Ptarmigan first became involved at Channels, Chelmsford in 2009 and successfully achieved planning for 750 units in 2012. Since then Ptarmigan has maximised the value of the site by overseeing the installation of delivery and the sale of multiple lots to various housebuilders. In the 2016 Local Plan Ptarmigan received a further allocation for 1,000 homes and 500,000 ft2 of employment space. This site had been held by the landowners family for over 80 years and was previously used for gravel workings followed by golf. Working closely with the family, Ptarmigan has delivered an initial 750 homes in a carefully created landscaped setting surrounded by trees and lakes, installing all the roads, sewers, utilities and landscaping required to make it a successful development and a long term legacy for the landowners who continue to live on the land and operate a restaurant and leisure facility, boutique hotel, golf destination and other facilities. The open space site is managed by a dedicated site management company currently owned by the landowners, guaranteeing long term stewardship for the benefit of the whole community. 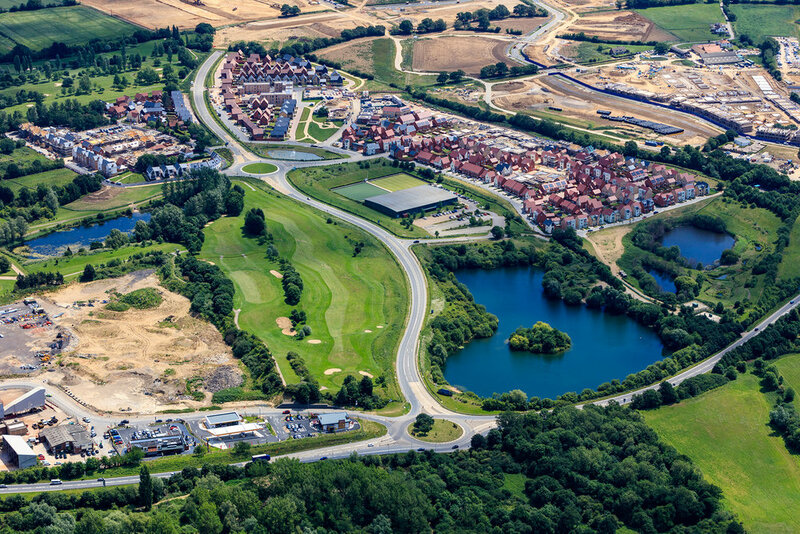 As soon as planning was granted Ptarmigan worked with national housebuilder Bellway to deliver the “RDR” (Radial Distributor Road) – creating the first leg of a new major road linking Essex Regiment Way to the Boreham Interchange on the A12. Ptarmigan’s section was delivered on time and on budget in 2014. At the same time a new 4km trunk sewer was provided. Ptarmigan has managed the co-ordination and delivery of all the site wide infrastructure and landscape, as well as the Channels Bus Service.